Financial Freedom - Financial freedom is flexibility. I love to have the flexibility in my wallet to do whatever I choose, when I choose. Financial Literacy - Of course not….but don't expect to get very far if you aren't! When people tell me that they don't like investing, I think, "How do you "not like" investing? That's the only way to fund your goals? You need to teach yourself to love it." Budgeting - You should always prioritize your goals. Find out what each of your goals costs and then ask yourself how you can best get the money to fund them. Fast way to Financial Freedom - Sure. Win the lottery! Seriously, I think the fastest way to financial freedom is to control your own destiny. Too often we hope that someone will "give us a raise" or "notice that we're working hard and pay us more." Give yourself raises by opening up your own side business. Study successful people….how many of them work for someone else? A few do, but the way to success largely is by learning to be independent. Saving money tips - First, make it automatic. If you try to trust yourself to save, you won't do it. Second, set up a meeting with anyone involved with your budget. My wife and I call ours the "family money meeting" and we have it weekly. Budgets for a family are more about communication than they are about numbers on a spreadsheet. Third, look at the big items like credit card debt, your mortgage and taxes before you look at the little stuff. Sure, you can save $20 by not eating dinner at a restaurant, but you can save hundreds or thousands with a better tax strategy. 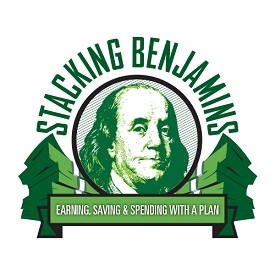 Where to start - You should start at Stacking Benjamins! Ha! Start by getting educated. We started the podcast as a laid back way for "non-finance" people to get educated. Find what works for you and run with it. You'll find that the top gurus all tell you to start with your goals. What do you want? What does it cost? How much do you need to save per month to get it? Once you have those numbers, then it's easy to prioritize and see what you'll really work for and what needs to be deferred.